The renewed fighting between the Taleban and the US and Afghan troops near the Pakistan border shows the continuing threat from Afgans opposed to the presence of foreign forces. There has been an increase in ambushes and missile attacks on US-led coalition forces in the Pashtun-population southern, eastern and western Afghanistan in recent months. But the fighting at Spin Boldak it is the first time since March last year that the Taleban have fought a pitched battle. In the spring of 2002, most Taleban and al-Qaeda fighters holed up in the Shahikot valley near Gardez escaped after coming under severe bombing by US warplanes. The Taleban ability to fight pitched battles a year after being ousted from power is proof of their tenacity. It is also an indication that they are gaining in confidence and regrouping. Their area of operation is in their former strongholds in the Pashtun tribal heartland bordering Pakistan. Most Taleban had trimmed beards and changed headgear before melting into the Afghan countryside after losing power in November-December 2002. 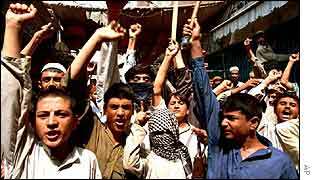 Their leaders went into hiding in Afghanistan or crossed over to Pakistan, where they still enjoyed the sympathy of most Pakistani Pashtuns inhabiting the North-West Frontier Province and Baluchistan. It was not difficult for them to remain in touch and wait for an opportune time to activate the Taleban movement. Beside the Taleban, former Afghan prime minister Gulbuddin Hekmatyar is also opposed to President Hamid Karzai's government and to the presence of foreign troops in Afghanistan. Hekmatyar is more organised due to his long experience as a mujahideen leader fighting the Soviet occupation troops in Afghanistan during the 1980s. He is also adept in propaganda warfare, which explains the spate of statements coming from him and previously unknown armed groups claiming responsibility for attacks against the US-led coalition forces in Afghanistan. He has taken the lead in declaring "jihad" - holy war - against foreign troops, terming them an occupation force in his homeland. However, Hekmatyar lacks military muscle. Almost all his military commanders deserted him when he fled to Iran after suffering defeat at the hands of the Taleban in the mid-1990s. His whereabouts are unknown following Iran's claim last summer that he had been expelled. His supporters say is he is hiding somewhere in Afghanistan. The US military authorities once tried to kill him when a pilotless predator plane fired a missile at his suspected hideout in the eastern Kunar province. There is little evidence that Hekmatyar has joined hands with the Taleban and al-Qaeda to conduct joint military operations against foreign forces in the country. Both Hekmatyar and Taleban officials have denied reports about an alliance between their groups. It appears that there is still no co-ordination among the opposition groups. Small bands of fighters - some of whom are not linked to the Taleban or Hekmatyar but are seeking revenge after suffering human and material losses due to US bombing - are operating in the mountainous Paktia, Paktika and Khost provinces in southern Afghanistan. Establishment of a joint command structure by the opposition is unlikely to materialise any time soon. The armed opposition groups would need outside support to coalesce into an effective fighting force. Pakistan and Iran's role was crucial during the war against Soviet Red Army in Afghanistan because they provided bases, weapons and training to the Afghan mujahideen. No such support is presently available to the Taleban, Hekmatyar and remnants of al-Qaeda. And most Afghans want peace and stability after 25 years of civil war. But prolonged presence of foreign forces in Afghanistan, US invasion of Iraq and failure of the Karzai government to deliver on its promises would win new recruits for Taleban and Hekmatyar and contribute to the popularity of their cause.